Now there is an easy way to manage and organize wires run to battery terminals. Blue Sea Systems has developed a fuse block that connects directly to the battery terminals and provides four fused connections. Ideal for stereos, bilge pumps, USB outlets, and other circuits that require constant power and tailored circuit protection. 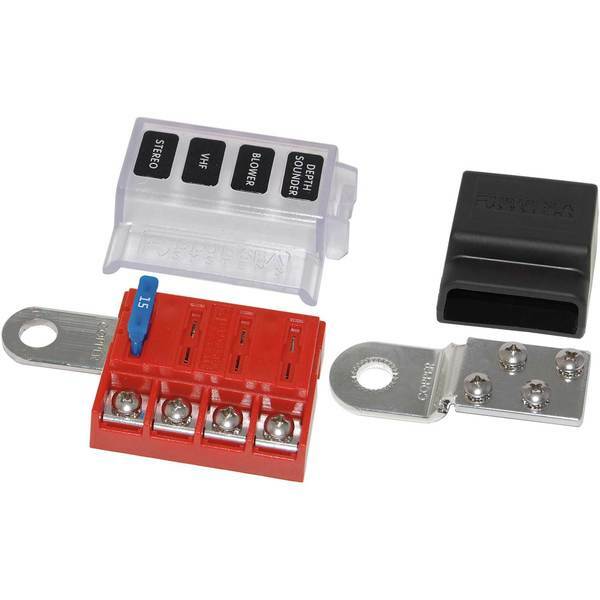 Included in the kit are both positive and negative terminal blocks; each is built on a heavy gauge tinned copper bus and provides a solid foundation for up to four terminals. The positive block incorporates four slots for ATC or ATO fuses (not included). A covers prevent accidental contact, complies with ABYC and USCG insulation requirements. The positive cover provides space for write-on labels. Also included are the required ring terminals to make the connections to the positive and negative bus bars.